Remove the skin from the chorizos. Slice the meat into pieces and place in a small skillet over medium heat. Stir constantly for about 10 minutes or until the chorizo begins to brown. Wash the bell peppers well in fresh water. Cut each pepper length-wise into four parts. Clean out the insides, removing any seeds or white ‘veins.’ This will yield 4 canoe-like sections from each pepper, ready for filling. When finished cutting all the peppers, lightly spray with vegetable oil and place on a hot grill. Roast for about five minutes on each side. To prepare the vinaigrette, just blend the balsamic vinegar and brown sugar together. Place the pepper ‘canoes’ over a serving tray and fill each one with a bit of Spanish chorizo, goat cheese and fresh basil. Drizzle the sweet vinaigrette on top and garnish with freshly ground black pepper. Disfruta! Closing the lid on your grill will make cooking the bell peppers even faster. When I see a rainbow, I remember when my father would tell me to make a wish for each color and that they would come true when I least expected it. It’s said that a rainbow is a sign of good luck; maybe it even works in the kitchen! This recipe for stuffed bell peppers filled with chorizo, goat cheese and dressed with a sweet vinaigrette might just bring you success at the dinner table too! Preparing recipes that are easy, simple and cost effective is rewarding-it also lets you share more quality time with your loved-ones. 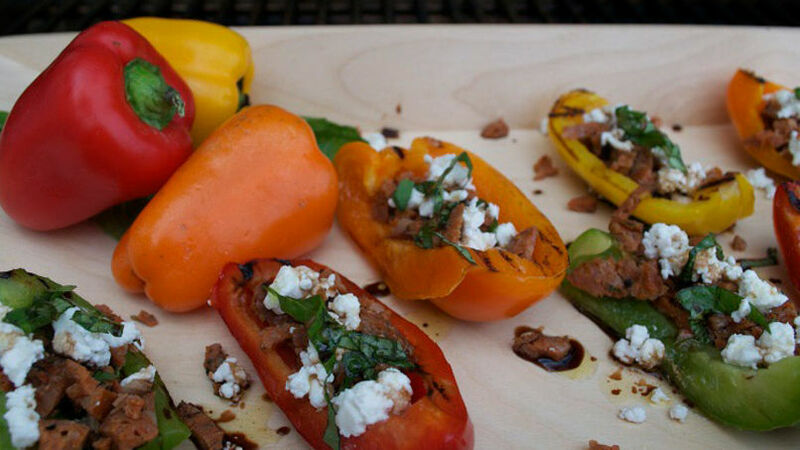 Try preparing these ‘lucky’ bell peppers and see how they light up your table with their colorful display of sabores.